When I ran across Hynek Schlawack's blog, I liked the simplistic beauty. When I took a look at the source, I fell in love. Here is my homage to beauty, to which I can only inspire. 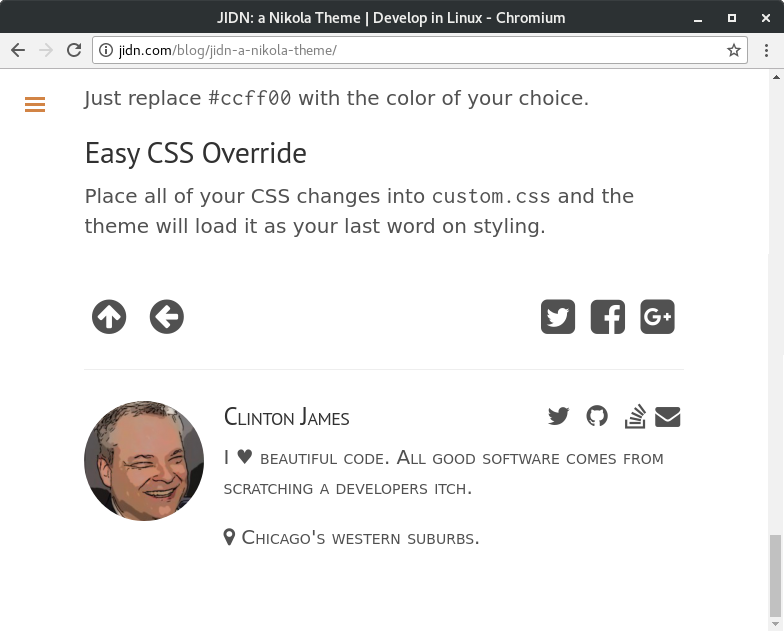 You can view the demo, where you can change between the different colors, at http://jidn.com/blog/jidn-a-nikola-theme/ and the code at GitHub. This theme is based on the lanyon theme. All the interesting things in this theme happen at the post bottom. Here is a quick look at the end of a post. You can see post sharing with Twitter, Facebook, and Google+. The author section contains a name, photo, and other configurable items. What you write is worth reading. But getting the word out about your post can be hard. This theme tries to make it easier for your readers to share your posts on Twitter, Facebook, and Google+. Sharing icons are seen at the end of a post. Author information is shown at the end of a post as long as the author name associated with the post has a corresponding entry in the configuration. While Nikola is commonly used with a single author, I figured we should allow for multiple. First, create a dictionary in the GLOBAL_CONTEXT of your conf.py with "JIDN" as the key. Inside this dictionary, add additional dictionaries, one for each author. Each of these dictionaries is added to "JIDN" with the author's name as the key. For additional authors, be sure to use the name as it appears in the post author metadata. So if the author section doesn't appear in your blog post, closely check that the author's name in conf.py to that in the post. [Required field] A URL to a 120x120 image of yourself or avatar. 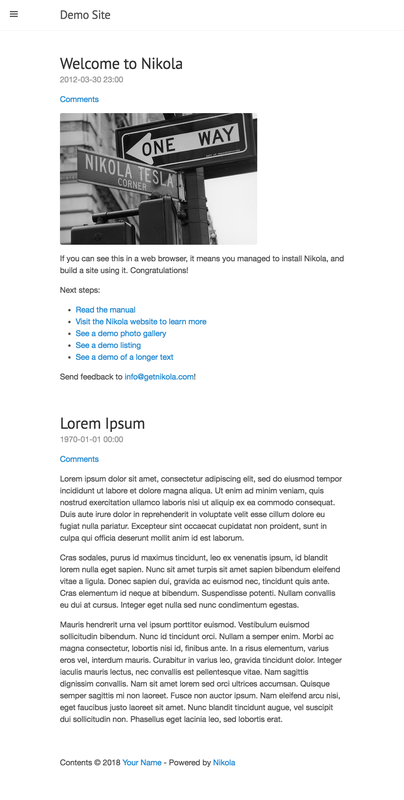 If you want a different size, you can change to dimensions in the CSS ( look for .author-image). A short biography of your self. A string providing your general or specific location. The lanyon theme was one of my inspirations. Thus, the JIDN theme supports all the same colored themes. However, instead of using a hex code to reference them, I use the color name to identify the theme. Available colors include red, orange, yellow, green, cyan, blue, magenta, and brown. To the GLOBAL_CONTEXT in "conf.py", add the key "JIDN-theme" and the value of "theme-base-*color*", replacing color with one of the available colors. So you don't like any of these color choices and you just have to have electric lime, #ccff00, as your color? Set "JIDN-theme" to "theme-custom"
Copy the following CSS to assets/css/custom.css and you are ready to hurt your eyes. Just replace #ccffoo with the color of your choice. Place all of your CSS changes into custom.css and the theme will load it as your last word on styling.